What Will the Channelside Redevelopment Bring to Tampa? Duncan Duo Tampa Real Estate Video Blog: What Will the Channelside Redevelopment Bring to Tampa? What Will the Channelside Redevelopment Bring to Tampa? Today, we want to talk about some things going on in downtown Tampa that we think are going to have a huge impact on our real estate market. We were at the press conference this week held by Jeff Vinik, where he shared the enormous plans he has for the redevelopment of the Channelside District. A number of financial backers, including Bill Gates, are going to help turn the area into a nightlife, entertainment, and residential district. A lot of great things - such as thousands of residential units, waterfront developments, and commercial developments - will be coming to the area because of this project. You can get some more information on this great project here! 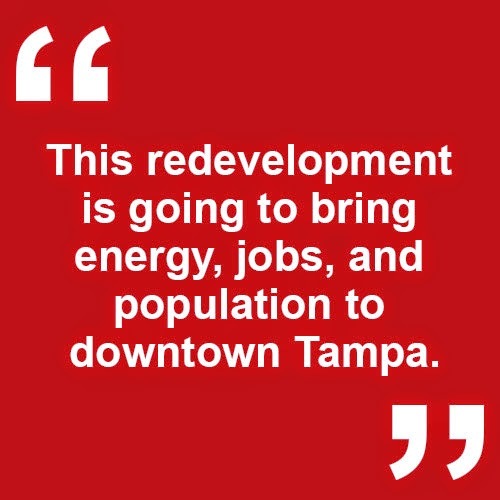 This redevelopment is going to bring energy, jobs, and population to downtown Tampa. Over the past decade, we've seen downtown St. Petersburg escalate into a thriving area, whereas downtown Tampa still needs some help. The goal of Jeff Vinik and some of his supporters is to get Tampa caught up with St. Petersburg. We suspect we'll see some nice gains in value and improvements in real estate markets in the areas around downtown, such as Harbor Island and Channelside. We're also looking forward to seeing some improvements in infrastructure, so people start heading downtown and visiting these new establishments. Overall, we hope to see a revitalization of downtown. We're very excited about these developments, as the real estate market in downtown Tampa is going to be completely different in 10 years. Keep your eyes peeled for further developments, as this is all very exciting news that will bring a lot of value to our community! If you have any questions about the Channelside redevelopment, or need help with anything real estate related, don't hesitate to give us a call. We pride ourselves on being the best real estate resource in the Tampa Bay area!